This is what Cabinet Secretary Leoncio B. Evasco said of alleged plans of Liberal Party members and some elite businessmen out to topple President Rodrigo Duterte. Speaking on Friday, during the induction ceremony of new officers of Zamboanga del Norte United Correspondents (ZNUC) – a group of local media practitioners here, Evasco said that no amount of talking would bring about destabilization. Plotters, he said, "have to have an armed component" to pursue their plans. The Cabinet secretary explained that the so-called elite in Manila identified with the Liberal Party could not accept that they would be defeated by somebody who comes from Mindanao. "That's because they look down on us, they did not know that our minds were molded by our experiences, our studies, and our outlook of life that the elite don't have," Evasco said. He added that the elite group first tried to destroy Duterte at the grassroots level by using the media, riding on issues of summary killings, extrajudicial killings, and the burial of former president Ferdinand Marcos. "Sad to say, there are a lot of media practitioners who succumbed to the temptation of money. And we are talking of millions of pesos here," Evasco said. Evasco added that plans for the coup attempt fizzled out, and the group went international, which is why, he said, American President Barack Obama, United Nations (UN) Secretary General Ban Ki-moon and the European Union want to investigate Duterte on human rights amid the rising number of drug-related killings in the Philippines. "And it was good they did it because it was an opportunity for (President) Duterte to enunciate his independent foreign policy," he added. "By being rich, America or the European Union or the UN have no right to tell us what is good for us. In pursuing an independent foreign policy, you must be a friend to everybody. And if the President is resisting the bullying of our supposed friend, the United States, it doesn't mean we are already aligning with the opposite, China or Russia." Evasco also said that those who are against Duterte are now saying he is a communist to scare people and entice the military and police to join them by engaging in armed adventurism. 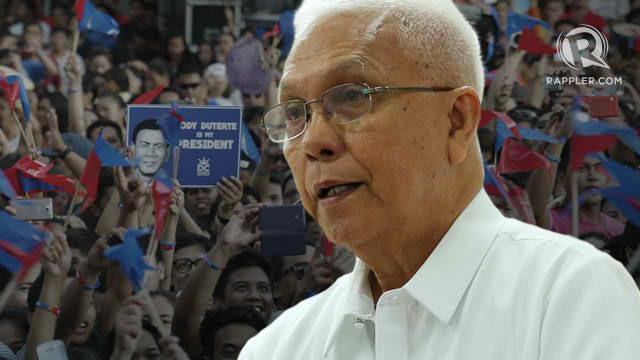 "But I want to tell you, my people in Dapitan and Zamboanga del Norte, they will fail, because anything you do – if it benefits the people – it will never be toppled down," Evasco said. Sponsor Trillanes dismissed the allegation as "absolutely not true." He said they were "nothing but a misdirection from the political backlash the Duterte administration has been getting as a result of its bloody war on drugs." Trillanes also said, "President Duterte brought the crisis upon himself when he started killing his own people. It was made worse by the series of diplomatic blunders and controversial statements by the President himself." Evasco reminded media practitioners in Zamboanga del Norte to be true to their chosen field of service: "The government and media have no other masters except the people. Tell the truth, defend the voiceless and the oppressed. That is not easy, a lot of your colleagues were killed for doing that." "But whatever it takes to tell and defend the truth, you face it because you committed to be media persons," Evasco said.